If you’ve been visiting here for a while you would have surely bumped into my best friend K in and around these posts. She popped up first here, during my first year of blogging and her move into a new apartment. Since then, she’s made many appearances. It’s inevitable really. Someone who is as much a part of my life as K will certainly find her way into the stories I tell. She dropped in to try my first ever attempt at soufflé. She is the mother of my awesome godchild Z. We’ve gone off on adventures together. She knows what I like and brings me lovely gifts. She tastes the stuff I make even if they don’t turn out as good as they should. She tastes the stuff that does turn out good! We try to save the Earth together. She recently gave birth to a beautiful baby girl and we celebrated with a tea party. K and I met in high school, and though on the surface we may seem very different (she is a gung-ho athlete who loves the smell of competition and I am a slow moving nap-lover who shies away from organized sports), it was the best friend version of finding your soul mate. Heck, forget versions, it was finding a soul mate! There are friends you bond with over common interests, friends due to some sort of proximity (same school, course, neighbourhood, family), and those serendipitous ones that happen by happy accident. Then there are those that you know are no accident…those who you know you were heading towards from birth and that become such an integral part of your life that you cannot imagine one without the other. That’s K.
Some people have masses of friends, hundreds, even thousands if you check here and here. But a true best friend is worth ten million times that in my book. And for her birthday you’ll want to try your darnedest to give her something really special – even if it’s just one of your favourite cookbooks and an Apple Bread baked from its pages. 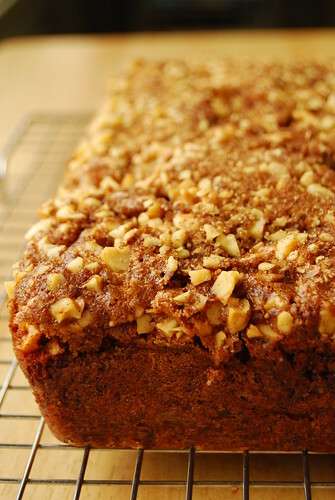 – For the topping, mix together the walnuts, sugar, and cinnamon. Set aside. – Beat together the sugar and butter until light and fluffy. Add the eggs and beat them in well. – Sift the flour, baking soda, baking powder, and cinnamon into the mixture and add a pinch of salt. Mix until just incorporated. If using a mixer I just give this a couple of turns with the paddle and then scrape down with a spatula, mixing the rest of the way by hand. – Add the apples, walnuts, and vanilla and mix through until just incorporated evenly. I did this with a spatula by hand as well. Scrape into a buttered and floured loaf tin (12×4 inch). – Sprinkle topping generously over the batter. Bake in a pre-heated 180C oven for 45 minutes or until at cake tester poked in the center of the cake comes out clean. My loaf took about 50 minutes. – Cool slightly before turning out carefully…the topping will scatter a bit! So do this over your serving plate so you don’t lose any. – Serve slightly warm or at room temperature…plain or with a scoop of vanilla ice cream! I have spoken about my love for Tessa Kiros before, and Apples For Jam is even more proof of why I am such a fan. Her enchanting “voice” draws me into her recipes like no amount of chef-cred, fame, or restaurant ownership could. So I wanted to share a bit of this with K on her birthday, along with Tessa’s delicious Apple Bread. This cake is beguilingly moist and laced with the spicy scents of apple and cinnamon – one of the best smells you can have coming out of your oven (if you live in a flat like me, this is a great way to get rid of fried fish smell)! The crunchy sugar-nut topping is the perfect foil to the cakes softness. A scoop of vanilla ice cream will not go amiss here. The only thing I have changed is forgoing the ground cardamom used in the original recipe. I have already made this two times, and both times everybody loved it…so despite its simple looks it is a definite crowd-pleaser.